We teach classes in apartment complexes throughout the CBD where parking can be provided for our instructors. Kids in Sydney need to be equipped with great swimming skills. Improve your child’s safety by providing the instruction they need as early as possible. Tanya’s Tadpoles offers private swimming pool lessons in the CBD for babies from 5 months old. We teach toddlers, pre-schoolers, and school aged kids up to junior squad level. We also teach adult classes. 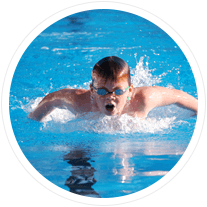 The best part is that you or your little one can learn to swim in a convenient and comfortable environment, as our friendly AustSwim and Swim Australia qualified instructors will conduct the classes in your own home or apartment complex pool. Our programs run throughout the seasons, so you can start your lessons whatever time of the year suits you. We teach children to swim independently, then we work on teaching them all 4 strokes, developing and refining their technique until they are ready for junior squads. 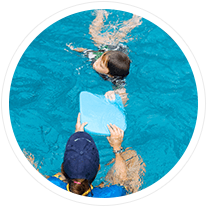 We incorporate water safety into all our classes, as this is such an important aspect of all kids’ aquatic education. Have the best fun around water safely. Remember, learning to swim is an important life skill, whether you live on the coast or in the Sydney CBD. Book your private swimming lessons in Sydney CBD today!